Tony is our Chief Education Officer. He oversees and instructs in our paddleboard (SUP), kayak and canoe programs, while also guiding Undercurrents’ identity and growth. Tony began his love of paddling at summer camp in the 60’s and that love continues to grow. He is Paddle Canada’s Senior Instructor in Alberta for both Sea Kayaking and Paddleboarding, and is one of the few paddlers in all of Canada who is an Instructor-Trainer (teaches you how to become an instructor) in all three paddling disciplines: canoeing, kayaking and paddleboarding. Tony is currently the Chair of Paddle Canada’s Program Coordination Committee, where they are driving the harmonization of Paddle Canada’s programs and standards. Tony lead the creation of the Paddle Canada national standards for paddleboarding, river kayaking, sea kayaking and camping. He contributed to the updated Paddle Canada canoe program, and the new Paddle Canada kayak rolling program. In most ways, Tony is a “one trick pony.” He owns and manages a paddling store (Undercurrents! ), teaches paddling at Mount Royal University in the Eco-Tourism and Outdoor Leadership (ETOL) program and wrote the gear review column in Kanawa, Canada’s Paddling Magazine. He met his wife, Donna, at the Bow Waters Canoe Club – their first date was a canoe trip and they also got engaged on a canoe trip. He named his cat after a river feature. 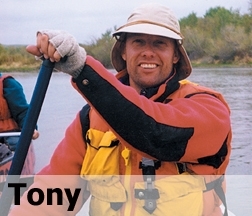 Tony volunteers with local, provincial and national paddling organizations, where he has held a variety of executive positions. When he gets time off, he likes to go (you guessed it!) paddling!